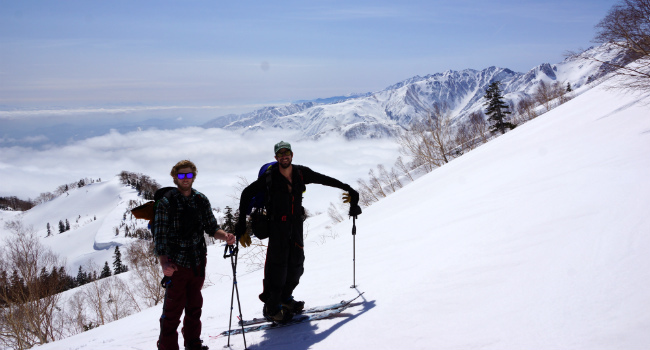 Come and explore the vast Hakuba backcountry and some of the very best powder skiing in Japan. The Japan Alps average 12+ meters of beautiful powder snow each year, and no other mountain range in Japan has comparable terrain with amazing powder! In Japan, or anywhere else in the world, it doesn’t get much better than this! Evergreen Backcountry Guides are certified avalanche professionals and seasoned backcountry guides. Ep 10-4 - Profile - Evergreen Outdoor, Hakuba, Japan from Big Jump on Vimeo. Discover the allure of the backcountry! The Intro to Backcountry course will introduce you to the fundamentals of ski or split-board touring in the Japanese Alps. For skiers or snowboarders this is the perfect course to try out backcountry terrain, get away from the resorts and learn all the basic points to get in and safely out of the winter mountains. By practicing with professional guides participants will have a solid base to build their backcountry adventures upon. 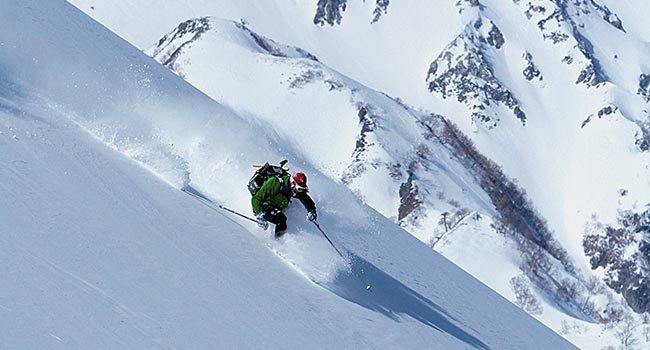 No previous backcountry touring experience necessary, though upper intermediate skiing and riding ability in Off-piste area is necessary to navigate the backcountry terrain. For those who are just starting to explore the backcountry. An intermediate ski, snowboard, or telemark skill level and a solid fitness level are all that is necessary. Participants on our Usagi (Bunny) Tour should be able to competently ride powder and negotiate through gladed trees and open bowls. The Usagi BC Tour requires hiking up slopes and ridges using alpine touring bindings & skins for skiers and snowshoes or split-board with skins for snowboarders. There will be approximately 3 hours of hiking broken up in the day and approximately 500~700 vertical meters of skiing. 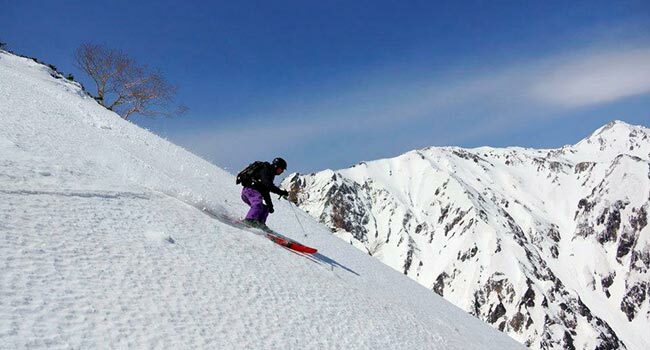 This introductory level tour is a great way to get off-piste, access epic terrain and ride the fantastic backcountry Hakuba has to offer! For the advanced skier or snowboarder who has joined our Usagi or Kitsune tour. You will have to be fit and have experience in the backcountry to join in on these challenging and exciting trips into Hakuba’s steeper terrain. The pace of this tour is a little faster as we aim to access a little farther off the beaten track in search of the best lines. 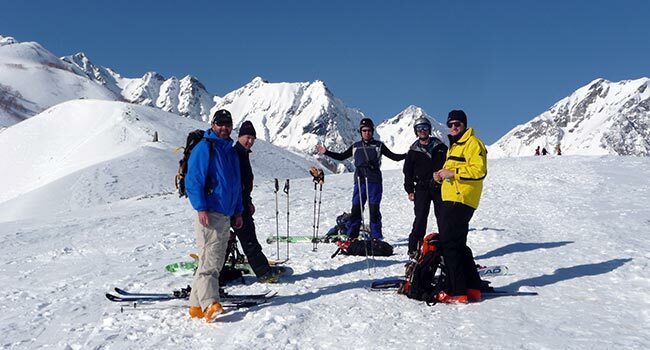 If you and your group are looking to venture off on a Hakuba backcountry tour of any level we can arrange a guide for your private group. This type of tour would be recommended if you have a group of friends with similar skiing/boarding ability and you would like to keep the crew limited to your group of friends. We provide complimentary pick up and drop off service for all our private tours. We kindly request credit card details for rentals outside of regular tours. If you are renting avalanche gear, you and all of your group should be familiar with using the gear, you should understand current avalanche conditions and have knowledge of your intended route(s). This is an important question as no one wants to be in over their head, holding up a group or spending their day standing around waiting for others to make it down the mountain. We do our very best to make sure everyone is grouped properly, however this process will only benefit you if it starts with a realistic assessment of your riding abilities. Please beware that our tours are geared towards advanced-intermediate, advanced and expert skiers. We will work with you through the booking process to explore in more detail your skill level so we can ensure you will get the most out of your day in the mountains. In the interest of safety, EBG reserves the right to direct guests to on-piste terrain, and/or a safe exit from the tour route, if it is determined that your skill level is insufficient to safely navigate natural hazards and keep up with the pace of your group. Please be aware that we are unable to give on-piste instruction and guiding, unless you have booked a private group tour where all participants are happy to change the tour itinerary. Refunds on tours or lift tickets in these situations will not be available. CRITICAL SKILLS NEEDED TO COMPETENTLY RIDE IN OFF-PISTE & BACKCOUNTRY TERRAIN. All skiers must feel confident making solid parallel turns, of varying rhythm and size, on steep blue or black angled terrain at an active pace. Being able to manage this terrain in deep snow or crud (depending on conditions) is of particular importance. Critical skills are being able to hold a strong edge for high traverses and the ability to read terrain effectively so you can avoid the pitfalls of flat benches, miniature gullies and deep pow that will often stop snowboarders in their tracks. Literally. Much of Hakuba’s best and most protected terrain is among the trees in areas with naturally occurring hazards, so you need to be able to navigate these and make turns where the terrain dictates. Many runs end with trails that are winding, narrow and bumpy ‘luge’ like exits where speed control is a requirement. With the assistance of your guide you can expect to cross partially open creek beds, flat cat roads and benches on which we may need to hike/walk across. This introductory program provides the first time off-piste skier/rider with coaching on how to translate the abovementioned skills into powder and variable off-piste terrain. Depending on the amount of fresh snow, you will need to make sure you have an appropriate fat powder ski or board to get the most out of your day. 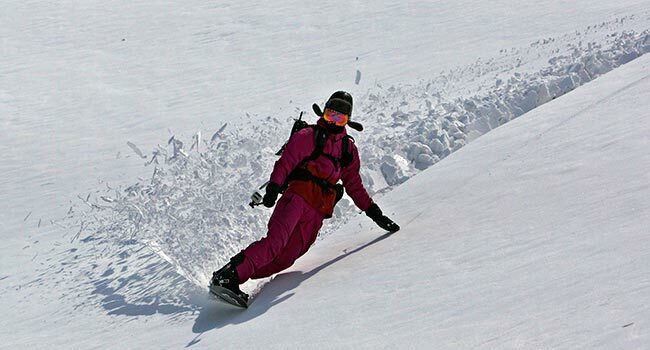 In these programs it is assumed that skiers/riders already have experience in powder, at least in off-piste terrain. You don’t necessarily need to have the best style but you need to be capable of making your way down the mountain at a reasonable pace relative to your group. BACKCOUNTRY TOURS: For guests who have NEVER been backcountry touring, you will join the Usagi tour on your first day so you can receive instruction on how to climb and using the safety equipment. We begin tours as soon as the snowpack is established – generally sometime in late December. Tours run through until April. Group tours: Guide, Backpack with Beacon/shovel/probe rental, Basic Rescue Insurance, Tax and ideally all the powder you can handle. Tour itinerary depends on the level of skiing / riding ability of your groups and level of fitness for uphill hiking (if applicable for your tour). Sign-in at 7:55. Tour from 8:00 – 15:30. Sunglasses (even if it is not sunny!) When you are hiking sunglasses are more comfortable to protect your eyes because they will not fog up. You can keep your goggles in your pack for the ski down. Basic Rescue Insurance (up to 1,500,000 yen) is included in the tour fee.